Marshmallow Snowmen Hot Chocolate, a mug of delicious hot chocolate with the perfect little additions of marshmallow snowmen, perfect for little kids and big kids just like me! 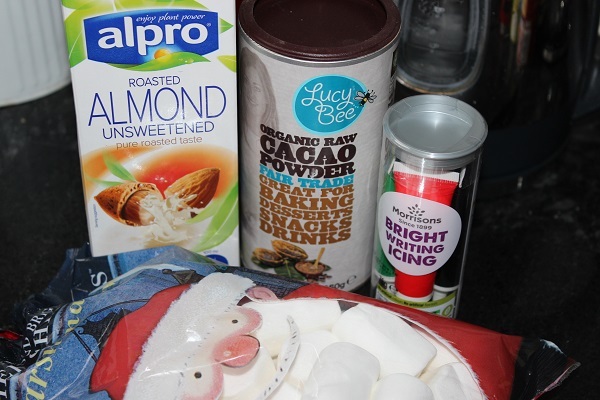 Now I like to use Lucy Bee organic raw cacao powder to make my hot chocolate, it’s a natural powder retaining the maximum value of antioxidants. Giving you a richer, fuller more traditional taste, with just a little bit of naughtiness by adding the marshmallow snowmen! 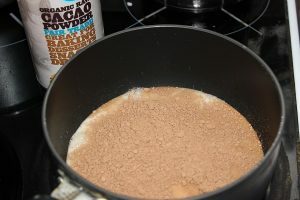 Place the cacao and milk or water into a saucepan. Warm gently on a medium heat until heated through. 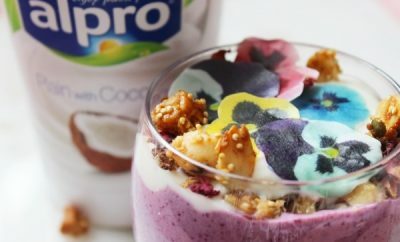 Place into a blender and give the liquid a quick whizz! Pop your lovely hot chocolate into your favourite mug. 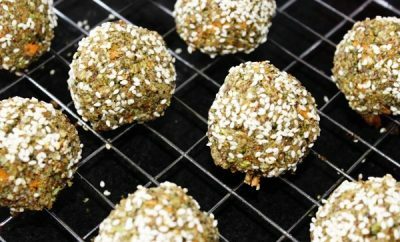 Take the white marshmallows and place on a plate. With the black gel colouring draw two eyes on the flat surface of the marshmallow. Then draw on a mouth. With the orange gel colouring, draw on a nose. As you draw, pull the gel upwards off the surface to make the nose stand away from the marshmallow. 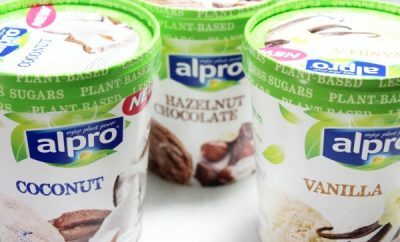 Place on top of your hot chocolate. 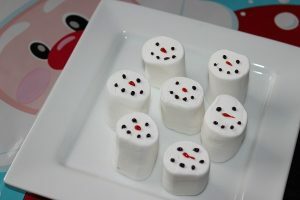 If the snowmen marshmallows don’t want to stay in the hot chocolate cut the marshmallow in half across ways. Chop the naked half into bite sized chunks and stir into your hot chocolate. 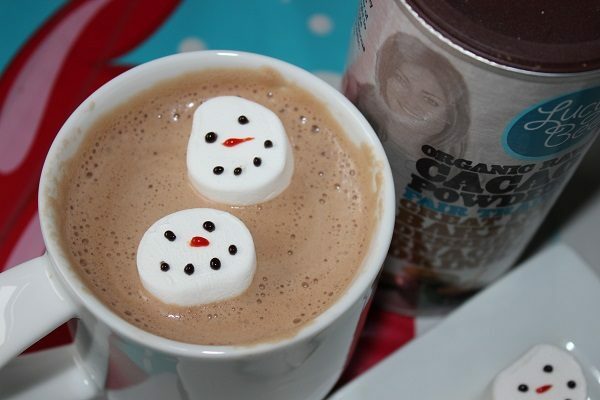 Place the snowmen onto the surface of your hot chocolate. For a more adult friendly version, a drop of brandy makes the hot chocolate just that bit more warming! 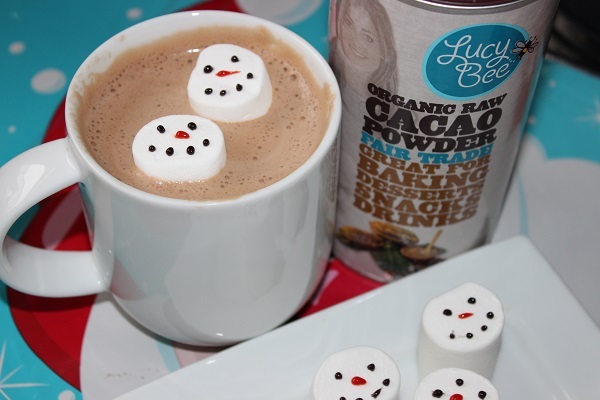 For some festive fun, try this delicious marshmallow snowmen hot chocolate and like me, I’m sure you’ll be hooked!